With time, Mac has gained popularity due to uptight security and beautiful interface. With all this, it also has grabbed the attention of hackers. Now, Mac is also vulnerable to pop-ups, redirectors, virus, and malware. The general intention of the hackers with all these malicious activities is to get the monetary benefit. Sometimes, when you install a freebie software on your machine, other software too gets installed without consent. That’s when you might have adware, pop-ups on your Mac. Advertisement every now and then on the website blocking your way. Redirected to a different page instead of the page requested. Fake Pop-ups on browser asking to update the third party software. If you notice any of these, then you have malicious content on your Mac. Looking for a solution to it, then you have reached the right place as we have listed some ways to remove the malicious content from your Mac for free. Once you have listed out the malicious software, it is time to remove them. Drag all the unwanted applications to the trash. After performing this action, don’t forget to empty the trash bin to remove the app from your Mac. You will get a drop down menu, press Option Key to make the Library option visible. Once the Library option comes up, click on it while pressing Option Key. Once the Library folder is open, look for the files and folders related to the deleted apps and remove them. Locate the files and folders related to the app under Application Support and Preferences folder as well and if spotted, remove them. Note: This Library folder is different from the above step as it is for a specific User. Click on Macintosh HD from your desktop screen. You will get to the Users folder, choose your Username(the name that appears on your locked screen of your Mac). In this case, the username is Mac. Once you are in your Username folder, locate Library. In the library folder, look for the support files for the apps removed and delete them. Once done, in the library folder itself, locate the files and folders related to the deleted app under Application support, Launchagents, Launchdaemons, Preferences and Preference Pane, Startup Items and remove them as well. You will get a drop down menu, press Option Key to make the Library option visible and Library comes up, click on it while pressing Option Key. Once the Library folder is open, look for Extensions folder. In the Extensions folder, find and delete all the support files of the deleted apps. In this way, you can uninstall malicious applications from your Mac. Sometimes unwanted extensions on your browser can also be a reason of all the redirectors and browser hijackers. In this step, we will discuss, how we can remove unwanted extensions from your Safari, Chrome, and FireFox. Open Safari. Now Go to Safari menu and click Preferences. Under Preferences Tab, click on Extensions. Check all the extensions installed and uninstall the unwanted ones. Click Preferences from Safari menu. Now go to General tab and change the Default homepage to Google.com respectively. Open Google Chrome and click the main menu button (three dots in horizontal line). From the dropdown menu, select More Tools-> Extensions. On the extension page, you will get the list of extensions installed. Uninstall the unwanted extensions by clicking on trash icon beside the extension. Open Google Chrome and click the main menu button (three dots in horizontal line). From the dropdown menu, select Settings. A Chrome Settings window will open. Scroll to the bottom and click Advanced. Once the advanced settings are displayed, scroll till you see Reset Settings tab. Click on the arrow and then click Reset to set the browser to default. Locate three horizontal lines on the Mozilla Firefox screen and click on it. On the next screen, locate Extensions from the left hand side pane. You will get the list of addons installed on your Firefox. You can disable the extension by clicking on Disable tab beside the unwanted extension. If it prompts, restart the browser. Open Firefox and type about: support in the address bar. The Troubleshooting Information page will open, click Refresh Firefox located at the top right corner. A new window will open to confirm the action, click Refresh Firefox button. Firefox window will close and go back to default settings. Once the work is done, Firefox window will open with the list of things imported, click on Finish to complete the action. 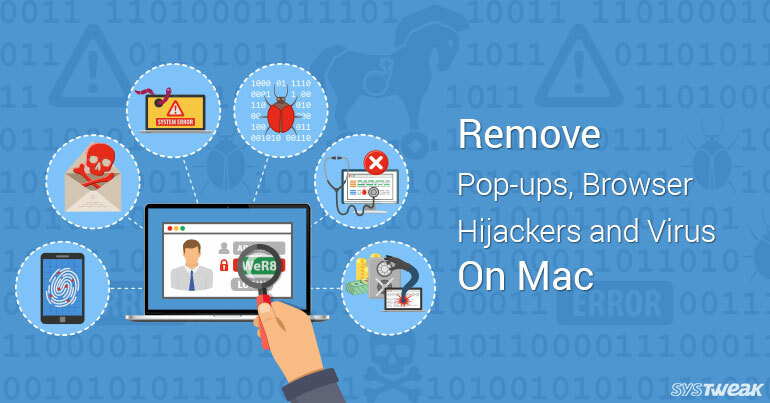 Now that you are a pro and know how to remove pop-ups, browser hijackers and virus from Mac, protect your Mac all by yourself.